Everyone loves having pets, but not everyone enjoys the hair mess that comes with owning a pet. You may find yourself in an important business meeting with your pants covered in your dog’s fur. Or, as you are eating, your plate may be decorated with your cat’s beautiful fur; you may lose your appetite, or you may be so used to being fur you have accepted your fate of being a furry pet parent. Do not let your pet’s coat control you! Instead, manage your pet fur epidemic with one of the best lint rollers available. Lint rollers are lifesavers when it comes to getting rid of tricky pet fur in a pinch. They come in a variety of sizes from wide coverage ones to small, compact travel sizes for on the go clean ups. Of course, not all pet hair rollers are the same. For a high-quality lint roller, consider one of the rollers on this list. WHAT'S INCLUDED: Your purchase will include 5 Lint Roller Refills and 5 Lints Roller Handles that can be used with all Comfy Clothiers Lint Roller Refills - 95 lint roller sheets per roll - 475 sticky sheets total! Struggle no more with annoying pet hair sticking to your clothes when using a Comfy Clothiers Extra Sticky Lint Roller. The easy, peel off design on this lint roller makes it easier for you to remove the filled up sheet in favor of a fresh, clean sheet. You will not feel any sticky residue on your hands as you handle the lint roller, and no stickiness will be spread on the surfaces that you use the lint roller. Even though the stickiness will not spread through contact, it is still strong enough to remove dirt, lint, and fur safely from all types of surfaces. 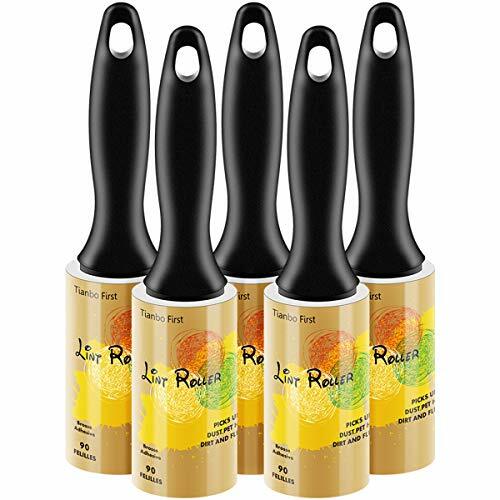 Use the reusable lint roller on your clothes, furniture, curtains, cars, and other hard to clean surfaces with ease. Each roll comes with 95 sheets, giving you plenty of sticky coverage to remove those pesky pet hairs. And do not worry about hurting your hand while cleaning as the ergonomic design is meant to give you a firm yet comfortable place to grip. If you are not satisfied with the lint roller, it comes with a 100% Satisfaction Guarantee where you can get a refund, no questions asked. Pet hair can be annoying but do not be annoyed at your pet because of it; it is only natural. Instead, turn to the Comfy Clothiers Extra Sticky Lint Roller to make that problematic fur disappear. Combat those annoying pet hairs that will not come off no matter how much you try to wipe them off with the Eigenheim Lint Rollers. Professional strength adhesive on each sheet makes it easy to quickly remove debris and pet fur from all types of surfaces without damaging them. Use it all around your home to effectively remove all sorts of debris with ease. Diagonal peels make it easier for you to remove the dirty sheet for the fresh sheet underneath. Each lint roller comes with 64 sticky sheets, so you always have a cloth ready at hand. The lint roller is guaranteed not to come apart when in use due to its robust and sturdy design. When you are done, the ABS plastic handle has a hole at the base where you can hang the lint roller on the wall for space saving storage. The lint roller is a risk-free purchase as, if you ever need to return the lint roller, it comes with a 100% Satisfaction Guarantee. The Eigenheim Lint Rollers will become your go-to a companion to remove pet hair from your clothes before heading out on the town. Without leaving any sticky residue behind, the Peekaboo Lint Roller will remove all types of debris from your home. This sticky lint roller can remove not only pet fur, but other annoying debris from all types of surfaces, like couches, beds, sofas, and different kinds of furniture. Its extra sticky tape will only need to be passed once over a surface to remove the undesired debris successfully. You can remove the dirty roller sheet easily thanks to the quick diagonal peel design. As a bonus, this lint roller comes with four refill packs for longer lasting uses. When done, just hang the lint roller by the cut out hole at the bottom of the handle for quick storage and easy access. Pet owners like yourself should not be caught with annoying pet fur on your clothes, especially if you are in an urgent situation. That is why you need to invest in the Peekaboo Lint Roller. A MINI FASHION MUST-HAVE: Available in styles ranging from arctic patterns to cool metallics and 6 interchangeable refill colors, Flint looks just as good as you do. A BETTER PLANET: Flint is reusable with 100% recycled paper refills for an environmentally friendly and lint free world. For an easy, on the go lint roller turn to the Flint Retractable Lint Roller. When you want to use the super sticky lint roller all you have to do is twist to open and extend it. Its protective casing makes sure that the lint roller does not pick up any odd debris when you are not using it, and so the sheets do not lose their stickiness. You can use this lint roller to clean debris off any surface with no fear of damage. Designed with small space in mind, you can take this lint roller with you when you travel or just when you need a quick clean on the go. Each roll contains 30 easy to tear sheets that you can refill easily whenever you need. The best part about this lint roller is that it is planet-friendly not only because it is a reusable lint roller, but because it is made of 100% recycled paper. The reusable Flint Retractable Lint Roller will soon become your go-to lint roller when you need to remove pet fur in a pinch. Quickly and Efficiently Pick Up A Lot Of Mess - Need to remove pet fur, hair or lint from your clothing, furniture, couch, carpeting, bedding, pants or even your car interior? No problem! Our Brush works wonders at keeping these furry places free of unwanted fur, hair or lint; a must-have cleaning tool for your clothes and furniture! Self-Cleaning, No Refills Needed - Unlike your tape-style lint roller, this fur remover brush has been designed to self-clean. That's right. All you have to do is dip the brush into the cleaning base & pull it out! "Voila!!" You no longer have to waste money on refills. Save time and money! Easy to Use - Follow the direction or grain of the bristles when brushing (going against the grain, not going with the grain). Next, dip the brush into the self-cleaning base and pull it out to remove the collected fur or lint from the brush, which remains in the collection tray at the bottom of the base. Lastly, pull out the tray and discard the contents. Simple and quite amazing! When reusable will not cut it, and you need a washable lint roller to consider using the Mudeela Pet Hair Remover Brush. Quickly pick up stubborn pet fur from your clothes or furniture with the double-sided hair remover brush. It offers 2x the cleaning power compared to traditional lint rollers, meaning that you will have a cleaner environment twice as fast. What makes this lint roller unique is its self-cleaning, no refills needed design. When the lint brush gets dirty dip the brush in the self-cleaning base and pulls it out to remove any lint or fur from the brush. Then, toss out the collected fur from the pull out tray at the bottom. It is simple and easy to use you will wonder why you never used the Mudeela Pet Hair Remover Brush in the first place! And, if you are not satisfied, it does come with a satisfaction guarantee. You will hassle no more with constantly buying clean lint rollers when you use the Mudeela Pet Hair Remover Brush. 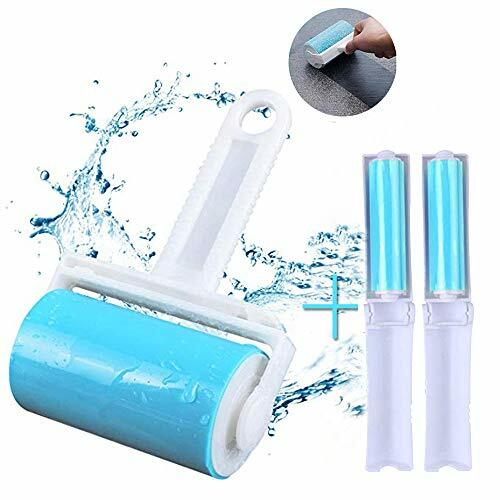 ◎ You will Get - 1 portable roller plus a sticky refill, 30 sheets a roller 60 sheets total, with the perfect measure of adhesive, you will effectively picks up pet hair, dust,and lint with ease to leave your area sleek and clean. ◎ Considerate & Portable Design - Intensive adhesive makes nearly no debris left, getting the job done faster and the cloth cleaned more completely. Parallel cutting lines of pieces, easy to tear off and save physical strength, sheets are guaranteed to tear cleanly every time. In foldable style, the little lint remover is portable for you to carry it in your pocket or bag to travel or business trip. 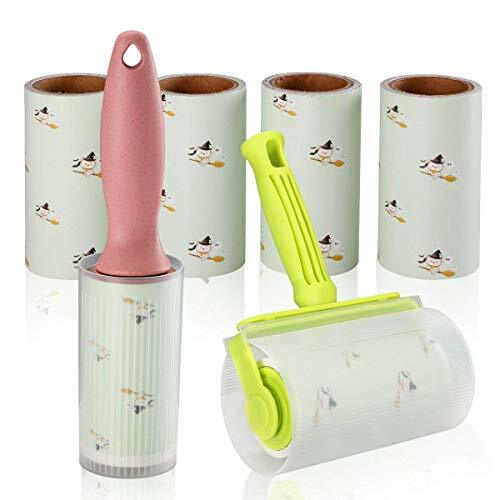 ◎ Durable Material & Protective Cover - The handle and cover are made of environment-friendly plastic, long-term use is guaranteed, and the protective cover can effectively block dust, protect the next sticky paper when you tear off the used paper and make for storage. ◎ Your Perfect Cleaning Aide - The pet hair removal brush is appropriate for removing lint or dust on the surface of clothes, carpet, sofa, bed sheets, furniture. Effective pet hair removal without risk of damaging any surfaces. ◎ Worry Free & 100% Satisfaction - We guarantee offer the best customer service possibly and always stand behind our product. If you have any problem of our product, please feel free to contact us and we will sort things out for you as soon as possible. Animal fur can strike anytime, anywhere, and if you are outside you will need a portable lint roller, like the Veeca Lint Roller, to make sure animal fur does not become a permanent accessory. Each portable lint roller comes with 30 sticky sheets that work effectively at removing debris and pet fur from not only your clothes but from furniture in your home. With how strong the adhesive is you will not have to pass the lint roller multiple times on the area of your choice. When the sheet gets dirty, you can remove it thanks to the parallel cutting lines. The handle and cover are made of environmental-friendly plastic guaranteed for long-term use. Since the roller can fold, that makes it perfect for taking with you when you travel or need to run a few errands. You will not be limited by carrying around a clunky lint roller thanks to the portable design of the Veeca Lint Roller. ★2 LINT ROLLERS+4 REFILLS: 60 sheets per roll-360 total sheets; two kind of handles for all kind of cleaning needs. ★PROTECTIVE COVER: This protective cover can prevent dust,protect the next sticky paper when you peal off the used paper and good for storage. ★DURABLE HANDLE: The handle of lint rollers is made of PP glue,which is durable and stylish that will not broke up so easily like others. ★CONSIDERATE DESIGN: Pet hair lint rollers have a diagonal cut that makes peeling off extremely easy. Practical handle with hole allows to hang up for storage. ★MULTIPURPOSE: This sticky lint roller ideals for tackling lint, fuzz, dust, crumbs and other dirt on practically all clothes, furniture, furnishings and any household, car or office surface. Its small size make it conveniently store at home or carry during traveling. Pet hair will no longer cling to the surfaces in your home thanks to the Livememory Lint Roller for Pet Hair. You may be used to one kind of lint roller handle, but Livememory offers you two different types. One is the classic handle with a hole drilled at the bottom for easy hanging. The second mimics what a paint roller handle looks like so you can roll the lint roller faster to cover more area more quickly. With 60 sheets per roll, you will have use per roll before having to use one of the refills. Each handle is made of durable PP glue, so it should last longer than most other handles. 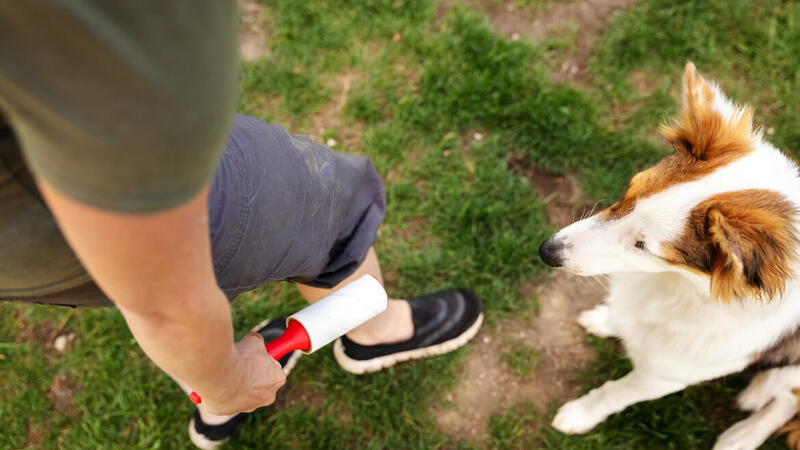 Use the lint roller on all types of surfaces to remove even the peskiest of pet hairs. With two different handle types, you should have no problem removing pet hair with the Livememory Lint Roller for Pet Hair. ✅ VALUABLE PACK: Extra REFILL! Total 120 sheets in one package. 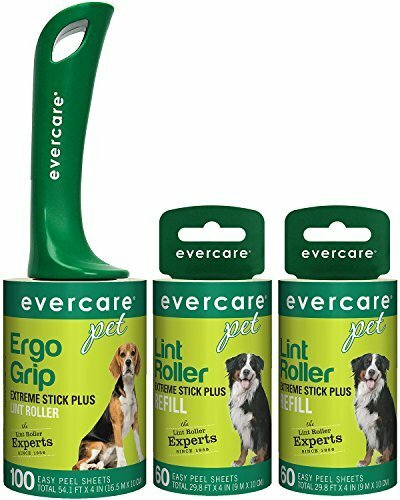 Economical combination and great value.Met lint roller extra large two refills and these extra large lint roller for pet hair available. For more coverage without needing to pass a lint roller multiple times use the MetLintRoller Supersize Roller. The problem with some lint rollers is that they are not big enough to cover a large amount of space in a small amount of time. MetLintRoller’s Supersized Roller measures 6.30 inches wide, meaning that you will be able to take pet fur off all types of surfaces more effectively when compared to smaller lint rollers. With an extra firm side grip, you will not have to worry about struggling to use the additional sticky lint roller or it coming apart as you use it. When you are not using the lint roller, slip the included protective cover over it to hide any caught pet fur and to prevent the lint roller from losing its stickiness. Premium quality lint rollers are hard to come by, but with the MetLintRoller Supersize Roller, you will have that problem no more. If you are familiar with Scotch’s super adhesive tape, then you will be glad to know that adhesive power stays true to their Scotch-Brite Lint Roller. 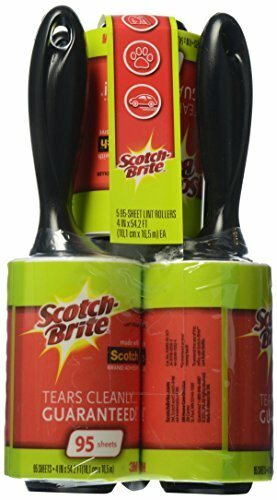 Scotch-Brite is a great lint roller when you need to remove pet hair in a pinch. Its super sticky adhesive that the brand is well known for will quickly pick up pet hair from your clothes, car, furniture, and other fabrics. You can keep it at home hanging in reach thanks to the hole drilled at the bottom of the handle, or you can tuck it away in your bag or car for reliable access and usage. Speaking of handle, this roller’s handle is ergonomically designed, so it fits comfortably in your hand. Tearing off the dirty sheet for a clean one is simple since it tears cleanly right down to the last sheet. For a lint roller with strong adhesive, not many can top the strength of the Scotch-Brite Lint Roller. Cleanliness feels good, and the Tianbo First Lint Roller will ensure that you always feel clean from morning till night. Extra sticky sheets effectively remove lint, fuzz, debris, and pet hair from all types of surfaces in only one pass. You will not have to worry about damaging the surface you clean as the adhesive is safe and non-abrasive. The handle is made of strong ABS plastic so that it will be both comfortable in your hand and it will be resistant in case it was to be accidentally dropped. 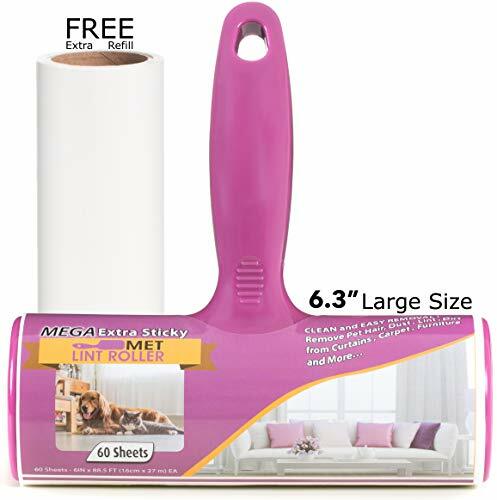 Each roller comes with 90 sheets, and since you get five rollers in this bundle you will be getting 450 sheets total; you will have plenty of easy to remove roller sheets to work with to get rid of any annoying pet fur that you may be exposed to. With 20 years of cleaning experience, you should have no problem trusting in the cleaning power of the Tianbo First Lint Roller. ✿SUPERIOR CLEANING: With a super power to attract hair and dirt without any gluey residues left behind, our hair roller is colorless, tasteless and non-toxic. You can be sure to buy safe. 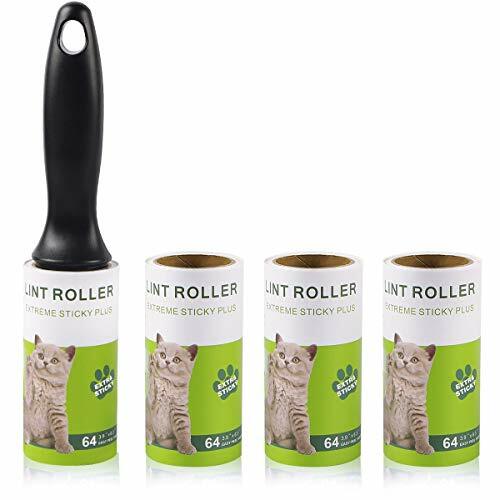 ✿FULL SATISFACTION GUARANTEE: The Airbin Pet Lint Roller is a set of 360 Sheets and A handle. Each set includes 60 Sheets. It comes with Airbin 100% Satisfaction Guarantee! Have superior cleaning power by using the Airbin Hair Roller. Lint rollers need to serve multiple purposes so you can clean any surface, anytime, anywhere with ease. Each adhesive sheet has superior cleaning ability to attract pet hair easily. The handle is made of environmentally-friendly plastic that is non-toxic and won’t oxidize or break off through multiple uses. Each roller comes with 60, easy to remove sheets so you will have plenty of sheets to clean within this amazing bundle. And, the rollers come with a Satisfaction Guarantee where you can get a full refund if needed. Thanks to the superior cleaning power of the Airbin Hair roller, pesky pet hairs will no longer be an issue. When you need an assistant to keep you and your furniture clean of pet hair turn to the Metkix Extra Sticky Pet Hair Remover. 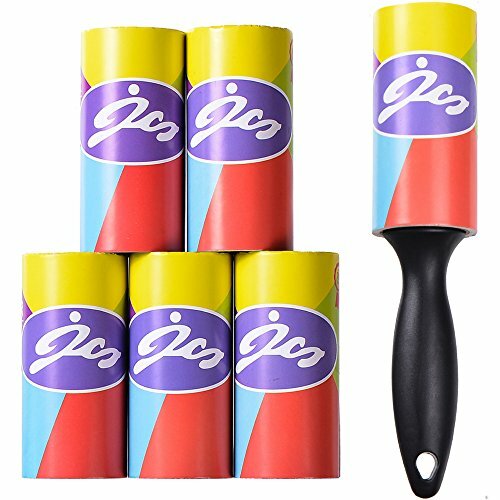 You can use this roller on all types of surfaces, even delicate ones like silk fabrics or leather furniture. You may feel like the Metkix lint roller will be your assistant with how durable, useful, and reliable it is. Even though the roller is sticky, it will not leave any residue, and it will not be difficult to remove a used roller sheet for a clean one. 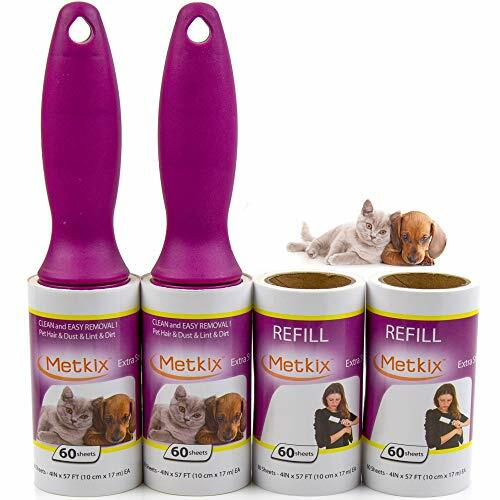 Pet hair will become a thing of the past with the Metkix Extra Sticky Pet Hair Remover. 3 Piece Lint Roller Set includes 1 long retractable handle with 2 rollers,1 double-sided lint removal brush and small portable lint roller. Resuable and washable,saving you hundreds over disposable lint removal products. 8 inches surface,it has excellent adsorption,can effectively remove all kinds of fabrics clothing and carpets, cushions, sofas, quilts, sheets on the hair, dust, dandruff and other dirt. 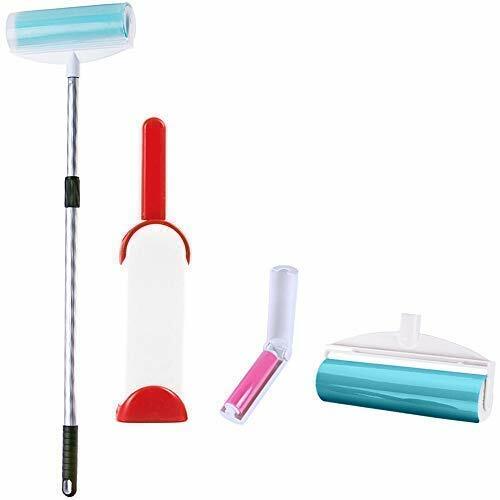 Retractable handle can meet your different cleaning tasks,the brush is double sided, when you are done with one side simply flip it in your hand and follow the direction of the arrow,even when it comes to cleaning the brush, it's very easy. Just dip the brush into the self-cleaning base and pull it out,the small portable lint roller is suit for travel, it can clean your clothes easily. The two rollers are used alternately,save your waiting time after washing. When you find pet hair in hard to reach places, then you will need the Clan Leader Retractable Lint Roller. You get three types of lint rollers in this set, one with a long retractable handle, a double-sided lint removal brush, and a small portable lint roller. You will have a lint roller ready for any situation. You will get excellent stickiness, easy to maneuver handles, and washable lint rollers so you will not have to worry about refills or removing used up sheets. You save money, and you protect yourself from walking around with pet hair. By using the Clan Leader Retractable Lint Roller you can remove pet hair from even the hardest to reach places. PET HAIR REMOVER LINT ROLLER CLEANER FOR CLOTHES No Refills Required Eco-friendly and reusable. Made of eco-friendly materials,100% reusable to save your money. The reusable sticky picker can clean your clothes without change refills, just refresh with light soap and water. Reusable roller for less environmental waste. 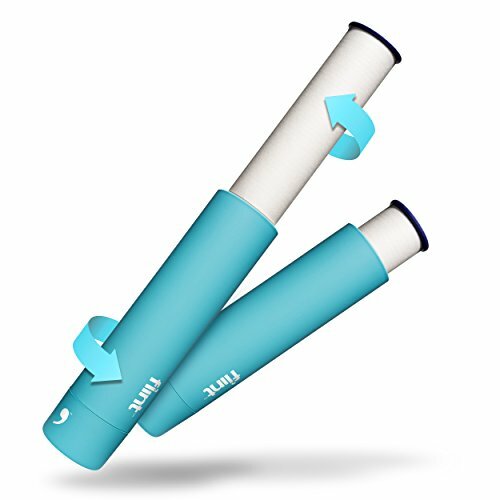 【Multipurpose】Lint Remover Roller The perfect lint remover for tackling lint, fuzz, dust, crumbs and other dirt on practically all clothes, furniture, furnishings and any household, car or office surface. More convenient than a vacuum cleaner and cheaper than dry-cleaning! 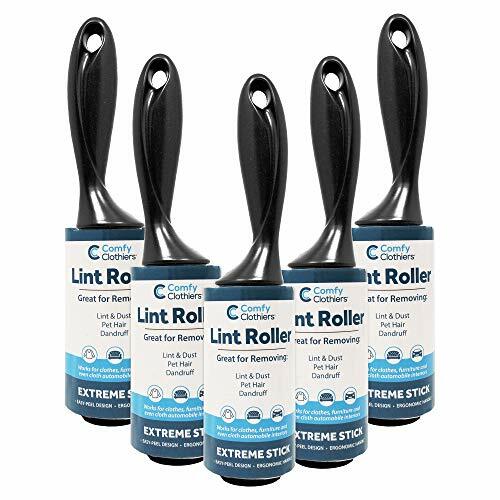 RESUABLE & WASHABLE LINT ROLLER Last Long Time - Easy to wash, just warm or cold water rinse with soap or detergent and then wait the lint roller completely dry before using it again, or just dry it by tissue. 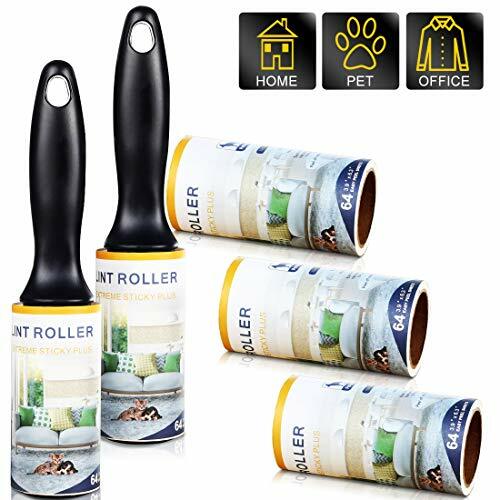 LINT ROLLER Portable & Convenient for Travel - The medium or mini lint roller can be taken into your bag, the mini lint roller even can be easy taken into your pocket. You can finish remove hair work anywhere. If you want an environmentally friendly lint roller, you can easily wash then you need to use the W Empty Washable Lint Roller. 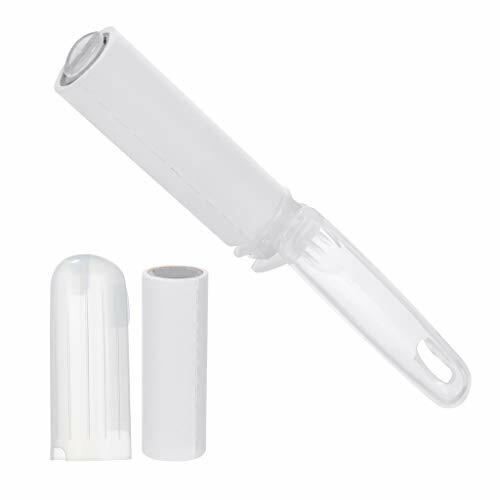 You will not have to struggle with removing sticky and dirty used lint roller sheets thanks to this lint roller being 100% washable and reusable. With some water and dish soap you can scrub away the collected fur and debris, let it air dry, and you will have a new lint roller ready to use again. But you do not only get a standard lint roller, but you get two mini and washable lint rollers that you can take with you on the go to remove pet hair anywhere at any time. With a bit of water, you will always have a fresh and clean lint roller to use with the W Empty Washable Lint Roller. (1) 100 Sheet Pet Lint Roller (2) 60 Sheet Refills - 220 Total Sheets! New ergonomically designed Ergo Grip Handle makes cleaning feel more natural. Extreme Stick Plus tape removes the toughest fur and debris from clothes & furniture, which keeps you looking great everyday. EVERCARE: the lint roller experts since 1956. Made in USA! 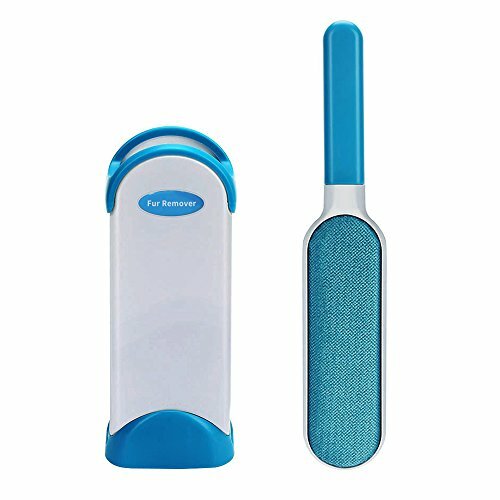 Evercare Pet Hair Remover is specially made to get rid of pet hair from all types of surfaces with ease. Pet hair can be easily removed thanks to the super sticky adhesive of each lint roller sheet. You can pass the lint roller on clothes, bed sheets, furniture, anywhere that pet hair can be found. The rollers will quickly pick up all debris without needing to pass it multiple times. The ergonomically designed Ergo Grip Handle fits comfortably in the palm of your hand so that cleaning feels natural and less painful. This company has been around since 1956 and sources all of its materials from the USA so that you can be sure of the quality and durability of this lint roller. When you have pet hair stuck on your clothes or furniture, do not rely on using tape to get rid of them as it can potentially harm the surfaces that you want to clean. Instead, rely on a lint roller that is specifically made to remove pet hair without damaging surfaces. These lint rollers will remove pet hair fast. Not every lint roller is the same, though, as some are larger, stickier, or are built more durable. You also need a lint roller that tears away cleanly and does not leave behind any sticky residue both on your hands and on the surfaces you are cleaning. The lint rollers suggested above are amongst some of the better lint rollers you can use thanks to their reliability, adhesiveness, and overall durability. Any of the suggested lint rollers will work wonders on removing pesky pet hair so go on and cuddle your loving pet to your heart’s content, these lint rollers will be there to get rid of the pet hairs that will stick to you. Read through our reviews of the best lint roller and use them as a guide to choose the most suitable product for your needs. Andrea is a proud dog owner and key contributor to Pet Struggles. 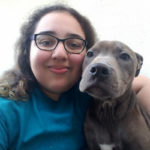 She has combined her love of animals and excellent writing skills to provide only the best recommendations and content to the readers at Dog Struggles. Copyright © 2019 Pet Struggles - Made with love by pet lovers.